Hope it is okay with you folks if once in a while 108.168.206.104/~fashions/ indulges in little self-praise? Fashionscandal.com was the FIRST to break the news ‘Globally’ on the 14th of May (Here is the link: http://wp.me/p1C8a1-Wq) that the famous funny-man, Jay Leno who is also an automaniac got a TATA NANO in his enviable Big Dog Garage. Since then the news has gone viral not only on Digital Media through On-Line sites, Twitter and Facebook but also has been widely reported by print-media in India and Abroad. Delhi’s popular fashion and lifestyle blog 108.168.206.104/~fashions/ was the first to report Leno’s brush with Bollywood. 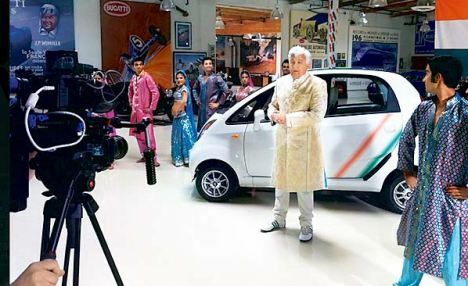 ‘Leno kept the affair absolutely Desi and even had dancers doing the Bollywood jhatkas and matkas as the NANO with Tri-Colour stripes rolled in to his garage. The man bowed down in front of the world’s cheapest car with a traditional Namaskar (sic),’ read the entry. India Today also carried a similar report. Thank you Liz. Hope to live up to your expectations!